Click here for a list of other Family Fun Events in Paris. Riding the Big Wheel at the Place de la Concorde is fun for the whole family. 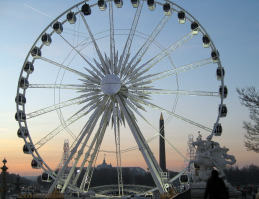 Children will be excited by the size of the big wheel and parents can sit back relax and enjoy sweeping views of Paris. The big wheel runs until midnight every night and is a great place to take in the Paris night lights. The Big wheel is located by the entrance to the Tuileries Gardens. The Tuileries Gardens have a couple of great playgrounds,including a small trampoline playground, all of which are well suited to children ages eleven and under. Older children might enjoy sitting up on the benches that overlook the Place de la Concorde and watching as pedestrians take on motorists at one of Paris's craziest intersections! The Musée de l'Orangerie (which I have to say is one of my favorite museums in Paris) features huge paintings from the water-lily series painted by Monet of his garden at Giverny, in Normandy known as the Nympheas. The lower level of this small museum features works by artists including Soutine, Picasso, Modigliani, Cezanne, Renoir, Derain, Matisse and Rousseau. The Galerie Nationale du Jeu de Paume, the national center for photography, includes collections of photography, film, video, and installations. Check out our photography exhibition schedule to see if there is anything on there right now. These are both small museums and relatively easy and interesting to tackle with children. For more information on current art exhibitions click here.